You'll be £25.00 closer to your next £10.00 credit when you purchase The Military in British India. What's this? T.A. Heathcote's study of the conflicts that established British rule in South Asia, and of the military's position in the constitution of British India, is a classic work in the field. By placing these conflicts clearly in their local context, his account moves away from the Euro-centric approach of many writers on British imperial military history. This new edition is a key contribution to The Praetorian Press's History of the British Army. After outlining the causes and events of the campaigns which the British in India fought against European and South Asian rivals for the succession to the Mughal Empire, T.A. Heathcote shows that disputes developed among the British themselves. These clashes broke out between the institutions in London that governed the Indian territories, the British governments in London and in India, and the civil governors and their military commanders. Disagreements also created tension between these commanders and their officers and the officers and their soldiers, both European and Indian. The Revolt of 1857 brought about a new army and a new constitution. Though there were no more wars in British India, controversies continued over the army's composition, organisation and political control, and T.A. Heathcote describes these in detail. He concludes with an analysis of the problems of recruiting and training the all-important officer corps, with the admission of Indians a crucial issue. This authoritative and well-researched account provides a greater understanding not only of the history of the British Indian Army but also of the Indian experience which had such a formative effect on the British Army itself. 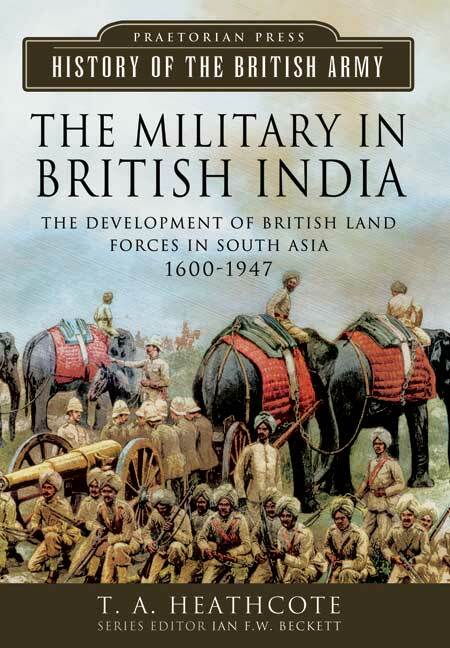 This is a very thorough, academic account of British Military in India. It provides a useful reference to those personalities and events which feature in other, perhaps less academic, accounts of "John Company" and "The Raj" and the index and footnotes (usefully added chapter by chapter) facilitate further study of a fascinating aspect of the development of Britain's Army. A book that should be read by anyone with an interest in military history - and the history of the British Army in particular. A valuable insight into how Britain came to add India to the Empire and gain its brightest jewel in the imperial crown. It will also appeal to anybody with a love of the sub continent. [The author] skilfully examines the rise of the East India Company. A fascinating account. This is an authoritative and well-researched account that provides the reader with a greater understanding not only of the history of the British Indian Army, but also of the impact that the Indian experience had on the entire British Army.